The next generation of 3D manufacturing simulation technology. Designed for manufacturing professionals and built on a powerful, flexible, and scalable platform. 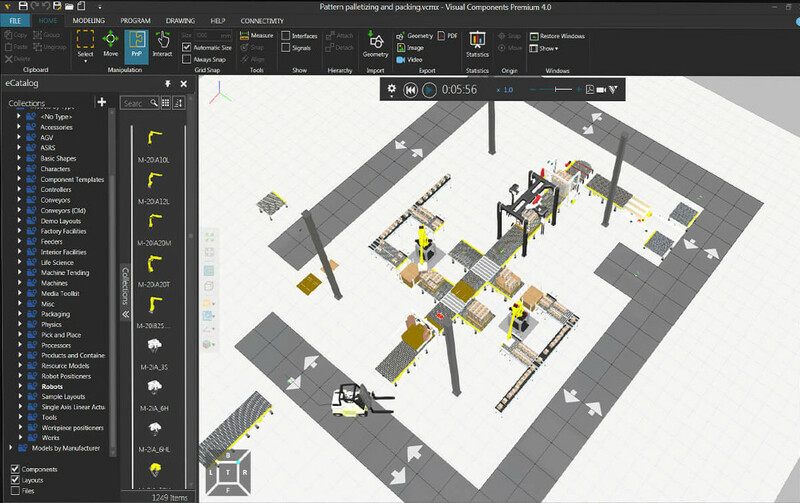 The Visual Components platform was designed to support advanced 3D manufacturing simulation applications. The physics behavior, powered by the NVIDIA PhysX engine, allows you to simulate and visualize functionality affected by physical forces, such as collisions, gravity, and material properties. Visual Components was developed to take full advantage of the 64-bit Windows environment. This means better graphics, faster loading times, and a much smoother user experience. Navigating large layouts is fluid. Memory management is constantly being optimized to improve simulation performance. The CAD converter has been optimized to import geometries into the Visual Components 3D world quickly. Visual Components utilizes a familiar ribbon user interface, so commands are well organized and discoverability of new features is easy. 3D navigation is always available, allowing for more flexible zooming, panning, and rotation of layouts. We’re constantly improving and streamlining user operations and workflows, to save you time in layout configuration and component design. The Visual Components architecture is open and modular, making customization of the platform easy. Visual Components is built on .NET, providing a familiar framework for many developers. We also have a Python API, which is available in all Visual Components products. The core services layer was designed to allow for easy customization of everything, from the UI to simulation behaviors. Copyright © 2019 Canonical Robots - Robots Colaborativos para la Industria 4.0. Todos los derechos reservados. Designed by JoomlArt.com. Joomla! es software libre, liberado bajo la GNU General Public License.